FRENCH POLICE HAVE arrested a former professional boxer who was seen punching police officers during a “yellow vest” protest in Paris, in shocking scenes that have highlighted the violence of recent protests. The images filmed on Saturday show a heavily built man in a black duffel coat square up to several police officers before knocking them down in a hail of punches and kicking them on the ground. One of the officers is then beaten by other protesters wearing yellow vests before he is rescued by fellow riot police in protective equipment and helmets. The ex-boxer, identified by French media as 37-year-old Christophe Dettinger, is a former professional fighter who reportedly works for the local government in the Essonne area south of Paris. Interior Minister Christophe Castaner said Dettinger, known in the ring as The Gypsy From Massy, a town south of Paris, had handed himself into police in the capital. “He was immediately arrested and will be held accountable for his acts by the justice system,” Castaner added. Around 50,000 yellow vest protesters took to the streets again on Saturday in cities around France to denounce the centrist government of President Emmanuel Macron, leading to clashes in Paris, Bordeaux and Rouen. Several men driving a forklift truck also smashed open the doors to the ministry building of government spokesman Benjamin Griveaux in Paris, who denounced the break-in as an “unacceptable attack on the Republic”. While the number of protesters has dwindled since December, the determination of a smaller but increasingly radical core of “yellow vest” protesters poses a dilemma for the government. On Friday, Griveaux said those still protesting were “agitators who want insurrection and, basically, to overthrow the government”. He called today for everyone to take part in a national debate on taxation and the government’s pro-business programme, which is set to begin later this month. Budget Minister Gerald Darmanin sought to distinguish genuine protesters, who want lower taxes and more help for low-income families, from those “who are in the business of ultra-violence”. “And faced with ultra-violence, we need to be ultra-severe. It needs to end,” he told RTL radio. French police signalled a tougher line last week when they arrested one of the leaders of the yellow vests, truck driver Eric Drouet, for organising an unauthorised demonstration. 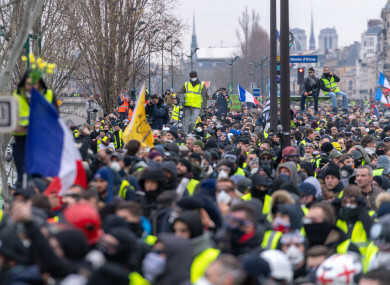 The move led to criticism from political leaders on the far right and radical left, who have encouraged demonstrators to continue taking to the streets to underline their discontent with Macron’s agenda. Images of a policeman striking several protesters in the southern city of Toulon on Saturday also risk fanning the flames. The police officer – a commander who was granted France’s highest award, the Legion d’Honneur, on 1 January – was referred to investigators at the weekend after appearing to punch a protester in the face several times. The yellow vest demonstrations have been frequently violent since they began in late November, particularly on 1 December when crowds ransacked a museum in the Arc de Triomphe and daubed graffiti on the famed monument. The French media has been targeted, while mock executions of Macron have also been a feature of some gatherings, notably in the town of Angouleme in southwest France. Dettinger, the boxer, could face years in jail if convicted over his rampage on Saturday on the Leopold-Sedar-Senghor bridge which links the Tuileries gardens to the Musee d’Orsay in central Paris. Assaulting a police officer can lead to up to three years in prison and a fine of €45,000, though sentences can be increased in certain circumstances. The French boxing federation issued a statement condemning the violence, saying that it “ran completely contrary to the values of our sport”. “The French Boxing Federation sends its support to the family and loved ones of the officer who was a victim of this individual, but equally to all the security forces who have been on duty these last weeks,” it said. Dettinger’s former coach, Jacky Trompesauce, had urged the father of three to give himself up to police earlier on Monday. “There was something that set it off, which I learned overnight,” Trompesauce told RMC radio on Monday morning, claiming that a woman was attacked by the police, prompting Dettinger to respond with a flurry of punches. Yellow vest protests against fuel taxes began in rural and small-town France in late November, but then mushroomed into a wider revolt during December against the policies and governing style of 41-year-old Macron. Email “Former pro boxer arrested after attack on police officers during Paris yellow vest protest”. Feedback on “Former pro boxer arrested after attack on police officers during Paris yellow vest protest”.